Most of us, when we love a particular show, franchise, or fandom; will simply gush about it to our friends. Maybe we'll dress up as a character from the series when given the opportunity, or join a club. Most of us will set a limit to our love, though. This artist is not most of us. Deviantart user KazeXenami was apparently so enamored of the Dubstep Gun - a weapon in the over-the-top Saint's Row IV that disables foes with superpowered beats- that he decided he would set out to build a working replica. I'm not just talking those cheap,crappy knockoffs that shipped with the collector's edition of the game, either. This thing is completely to-scale - meaning that it's pretty much a towering behemoth of bass-dropping circuitry. 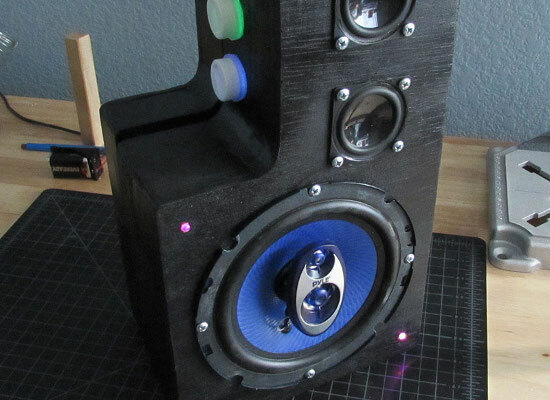 Kaze is building his replica out of wood and circuitry, with the aim of actually giving the device a working (and probably eardrum-shattering) speaker. Those of you who want to get a closer look at this awesome gun can check out his DeviantArt gallery here. He's also posted a few YouTube videos detailing the creation process (and showing that the weapon does indeed work). I'd definitely recommend at least looking at Kaze's DeviantArt gallery. He's posted some pretty awesome stuff on there; the Dubsteb gun isn't the first project he's tackled. Unfortunately, at the time of writing, there's no word on what he's planning to do with the replica - whether he's going to sell it off or use it as a prop for an awesome costume at the next convention he attends. I'm not sure which I'd rather see - I mean, I'd love to see this in action, but I'm not gonna lie - the prospect of owning one of these makes me kind of giddy. I'm certain I'm not alone in that.